Norman Fell (born Norman Noah Feld, March 24, 1924 – December 14, 1998), was an American actor of film and television, most famous for his role as landlord Mr. Roper on the sitcom Three's Company and its spin-off, The Ropers. Fell was born in Philadelphia, Pennsylvania on March 24, 1924, to a Jewish family. He attended Central High School of Philadelphia. He studied drama at Temple University after serving as a tail gunner on a B-25 Mitchell in the United States Army Air Forces during World War II. He later honed his craft at The Actors Studio. Aside from Fell's best-known television work, he also played minor character roles in several films, including the original Ocean's 11, It's a Mad, Mad, Mad, Mad World, PT 109, The Graduate, Bullitt and Catch-22 (as Sergeant Towser). He appeared alongside Ronald Reagan in Reagan's last film, The Killers. From 1961 to 1962, he portrayed Meyer Meyer in the TV series Ed McBain's 87th Precinct. From 1977 to 1979, he portrayed the main characters' hardnosed landlord Stanley Roper on the hit sitcom Three's Company (a role with some similarities to Mr. McCleery in The Graduate). He continued the role as the co-lead with Audra Lindley playing his wife, Helen, on The Ropers, a spin-off which lasted a year. He won a Golden Globe Award for Best TV Actor in a Supporting Role in 1979 for Three's Company. He was nominated for an Emmy Award for his dramatic performance as the boxing trainer of Tom Jordache (Nick Nolte) in the miniseries Rich Man, Poor Man. His final television appearance was a cameo as Mr. Roper on an episode of the sitcom Ellen in 1997. Fell died of cancer in Los Angeles on December 14, 1998, and was interred at the Mount Sinai Memorial Park Cemetery. He was 74. 1959 Hallmark Hall of Fame Wint Selby Episode: Ah, Wilderness! The Trials of O'Brien Mickey the Miser Episode: How Do You Get to Carnegie Hall? Episode: Where Does the Boomerang Go? 1994 The Fresh Prince of Bel-Air The Landlord Episode: What's Will Got to Do With It? ↑ Full name, a .JPG image of a memorial for Norman Noah Fell 1924-1998: AmazonAWS imagestore for Findagrave.com website. Retrieved on January 10, 2008. 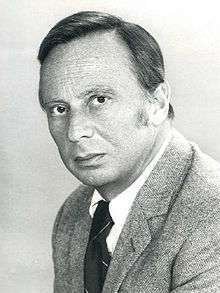 ↑ Profile for Norman Fell: Findagrave.com website. Retrieved on January 10, 2008. Wikimedia Commons has media related to Norman Fell.